The National Hardware Show will be taking place in Las Vegas, NV this May; Bird-X and Cozy Products® will be in attendance at booth #10558. Bird-X will be displaying their latest products at the National Hardware Show at the Las Vegas Convention Center. The show takes place May 9-11, with thousands of exhibitors representing 15 product categories. The show has a longstanding history spanning over 70 years in the home improvement marketplace. Visit the Bird-X booth #10558 to meet specialists and learn more about humane, effective pest animal and bird control. Along with humane Bird Control products, Bird-X will also be introducing Cozy Products® latest release, the Cozy Pet Warmer. The Cozy Pet Warmer is a radiant heating panel for pets that is safe to have in contact with other surfaces and has a wire-wrapped, chew-resistant cord. For more information on the National Hardware Show, visit http://www.nationalhardwareshow.com. Bird-X, Inc. has spent over 50 years protecting public areas from over 60 bird-spread transmissible diseases. The leading international brand of humane bird control solutions, this Chicago-based company manufactures a complete line of unique bird control products, protecting the health of humans, wildlife, and the environment by deterring birds from unwanted areas without harming them. 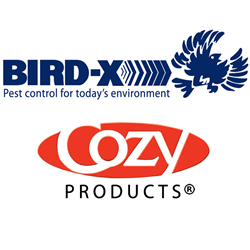 To learn more about Cozy Products®, a division of the Bird-X Group of Companies, please visit http://www.cozyproducts.com.